Hoping to target a multicolored crowd that's "losing touch with antiquated [...] ethnic messages," calling card company Rebtel partnered with Monsoon Media, creators of the decidedly-ethnic web comic strip Doubtsourcing. 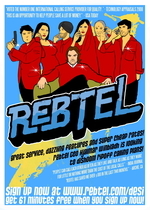 "Great service, dazzling features and super cheap rates! 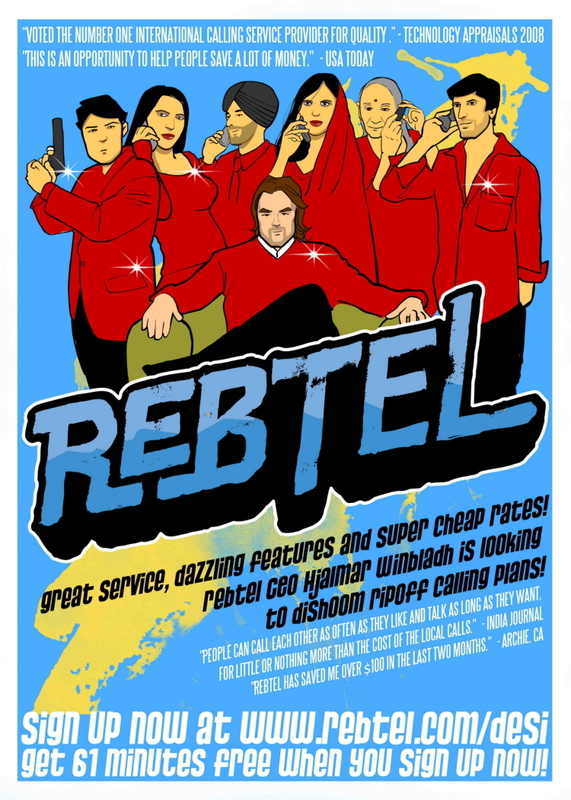 Rebtel CEO Hjalmar Winbladh is looking to dishoom ripoff calling plans!" the ad beams brightly. At first I thought I read that wrong, but the pressie says "dishoom" is the sound a Bollywood hero makes when punching a bad guy. Well then, all right. Future iterations of the campaign include a web component, some sort of tongue twister, and a third ad where a forlorn mother guilt-trips viewers into calling neglected relatives.